The facelifted Nissan Grand Livina will be launched in Malaysia early September, which is a little more than a month away. This is according to Campaign Asia-Pacific, a publication covering the advertising industry. The report says that Edaran Tan Chong Motor chose Draftfcb Malaysia as the ad agency responsible for the refreshed Livina campaign. Draftfcb won a three-way pitch that involved Leo Burnett and Bates. Besides the usual ATL TV spots and print ads, there will be a digital campaign, so keep your eyes peeled. 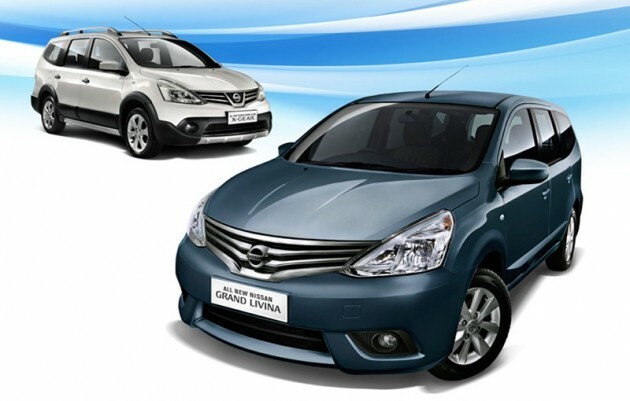 The facelifted Livina range, which includes the five-seater Livina X-Gear and seven-seater Grand Livina MPV, made its motor show debut earlier this year at Auto Shanghai 2013. You would have seen local spyshots of the Livina testing in Malaysia, too, snapped before the car was launched in Indonesia in May. In ASEAN’s largest economy, where the MPV is king, the Livina gets a new Xtronic CVT transmission with the revised HR15DE 1.5 litre engine, while the 1.8 litre variant soldiers on with the existing four-speed auto. In Malaysia, the pre-facelift Grand Livina uses either a 1.6 or 1.8 litre engine, both with four-speed autos. We suppose the latter will stay on unchanged, but the question remains whether ETCM will adopt the new 1.5 litre/CVT combo or maintain status quo. Not long to go before all is revealed! Facelift is a very convenient excuse for increasing a car price. Change the bumper a bit, reshape the grille a bit,voila, price adds another RM3000. How easy can it get? I think it looks nice. front is quite elegance and the back is a bit flat but is still acceptable. Malaysians should stop complaining about Nissan’s model offerings in their country – it’s even more pathetic in the Philippines. Nissan’s local unit, partly owned by its Taiwan affiliate Yulon Motors, kept the N16 Sentra in production for a decade & never bothered to replace it with the Tiida. They also introduced the Mexican-built North American Sentra, which is expensive. It’s only now that they started local assembly of the new Almera/Sunny series. no turbo? no addition air bag? no ESP? boringgg!! better buy proton or honda..
ESP please, you can do it. Shave off unnecessary accessories. Now people are moving towards safety-consciuosness. facelift or not this car is very recommended, nice balance between price, riding, quality, fuel consumption and comfort. but as always you guys will never had enough bashes, number 1 complaint 0 buy..
we want more than proton gives. we want turbo engine and dynamic handling. baru syok. 1.6 NA already sluggish now with 1.5?Unless the weight is around 1150kg or else forget it and take the 1.8 instead.I dun mind 1.4/1.5 if its turbocharged. Haiyaa, you bashers owned one kah? I had my GL Impul 1.8 for 4 years now and two of my friends traded their T Wish for GL after testing my car. No joke la kawan, this is the best affordable mpv in Malaysia in term of value for money. Seriously considering this new facelift if it has Impul version. Agree with you. Only THE REAL OWNERS will know this practically a good car. I’m drving 1.8L so I know this. Good power, FC not bad, good space due to folding seats, rear air-cond. IMHO only let down is the steering, numb and artificial. bold ,im think its for behind with grand livina. So poor man drive livina ?? I thought only kiasu drives wish…No ? From the main pic, looks like the X-Gear package is on the Grand Livina i.e the 7 seat version (white one). Will there be a Grand Livina X-Gear? If current livina still have a good sales, i dont think TC will sales this new grand livina….at All!! It all about coz.. except if this livina have 1.5 engine same as almera, so they can try push nissan to sell them 1.5 engine at cheaper price due to high volume. But Grand livina with 1.5? not possible. what ever it is..money will fly over with wind.. banker’s & seller’s will take our money hehe..
How about autech?? No info? Hi all friend i’ve planned to get new Grand livina soonest, whats to you thing? I just got my new GL last week, impul version with family package. Both exterior n interior are awesome! Love it so much except hav to be more hardworking to clean up the car cos it a white color. 1) there is a sound came from undercarriage whenever I pass thru a bump or have went thru some uneven road. It sounds like two steel sticks are crumpling n knocking each other, not very loud but u can definitely heard it if window glass are wind down. 2) there is also a sound came out from front right tyre area(unable to identify the specify place) when moving on the road. It sounds like a table tennis ball hitting on the table or wall. Not loud but can heard it when window glass are wind down. 3) the “D” gear can easily passby “N” gear n straigh went to “Reverse” gear. The gap in between these gear seems too loose. 4) the tailgate is not able to close tightly, u need exact position n pressure to push the tailgate (on the Nissan badge area) in order to close it tight. These are the issues I face after one week on the road. Will defiantly sent to tan chong for rectification. Other than the above, I am very comfortable with this car.